The City of Calgary is looking at turning Second Street S.W. through Mission into a one-way street with a separated cycle track. The City of Calgary is collecting citizen feedback on its plan to turn Second Street S.W. through Mission into a one-way street with a separated cycle track next year. The roadway is due to be repaved next summer in any case, so the city planners want to use that as an opportunity to upgrade the existing shared bikeway into a full cycle track heading into the downtown core. The plan would see Second Street become a northbound one-way route from 26th Avenue to 10th Avenue S.W. — with a speed limit of 40 km/h — alongside a separated two-way cycle track. 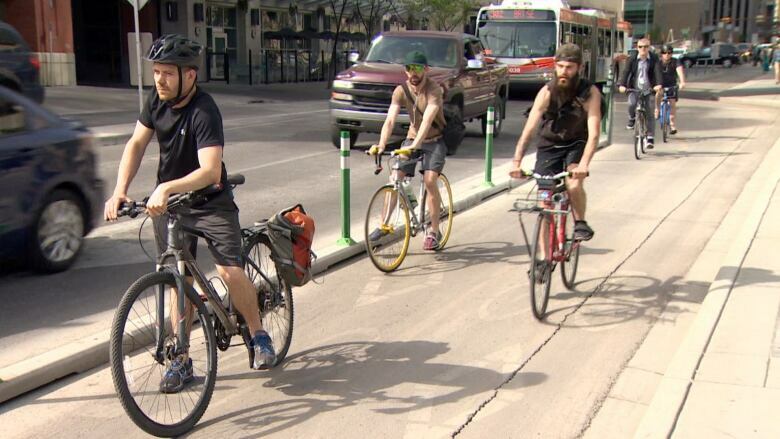 "We did some engagement in June, and we heard feedback that there was a lot of support of traffic calming along Second Street southwest, reducing vehicle travel speeds along the corridor, and that when people are cycling they do want more separation ... from people that are driving," said the City of Calgary's active transportation education planner, Katherine Glowacz. The plan calls for one vehicle lane to be available all day, plus an off-peak parking lane that becomes a morning travel lane. There will be permanent parking on the east side of the street, and parking all day except 7 a.m. to 8:30 a.m. on the west side. "Traffic is going to continue to run smoothly. There's not going to be major impacts," Glowacz said. "And we're looking at opportunities to also, at key intersections along Second Street, where there's higher left turn volumes, create some dedicated left turns." The city is collecting feedback on the plans until Nov. 16 on the city's website, and there are sounding boards set up at Second Street and 23rd Avenue and at 13th Avenue S.W. If approved, the project would begin next summer.